Apples and pears - great combo, but it's the Grape Cream Dressing that comes as a surprise! They liked to make a lot of dressings using mayo during this time period, but adding cream and grape jelly?? It's hard to imagine what this would even taste like. I wonder what the grape jelly does to the flavor of the apples and pears. Hmm!! I guess I'd have to try it. I wanted to add in this second, bonus recipe for Persimmon Pudding from the same cookbook. I grew up in Indiana where strange fruits like pawpaws and persimmons grow wild. Oddly, I've never had either of them, which is really sad if you ask me. Persimmons are a fall fruit, so it fits in well with today's post. 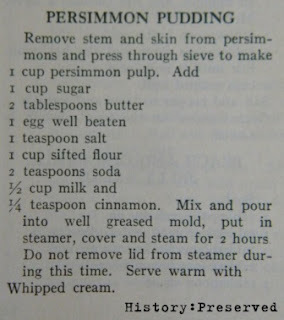 I think this pudding sounds really nice. I saw some persimmons at the store, so I'm going to have to give this one a try too!